It never fails. When winter rolls around and cabin fever sets in, I find myself making a wish list to update every room in the house. Although a lot of my creative attention right now is focused on the dining room, I’ve also had a strong itch to freshen up the bedroom. One of the easiest and most economical ways to change up a bedroom is to swap out your bedding. 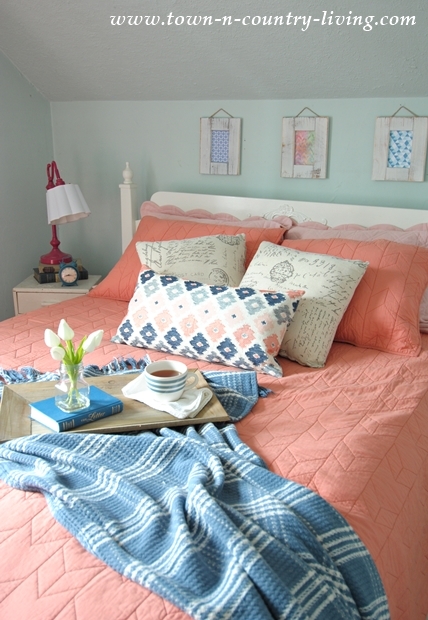 Normally I choose softer colors for bedrooms in my home, but this time around I decided to wake up my farmhouse bedroom with new coral bedding! 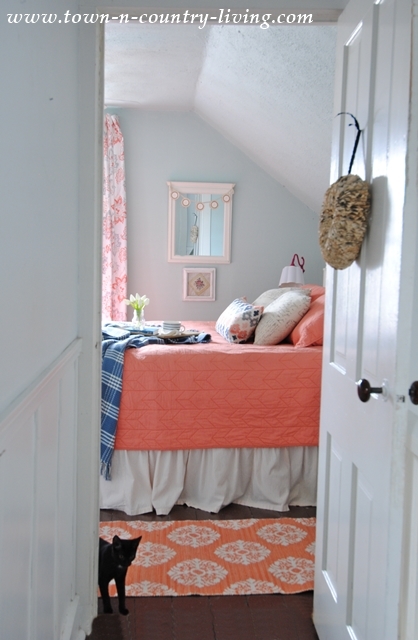 I added a new quilt, shams, pillows, area rug, and curtains … all with a bit or coral … to our under-the-eaves bedroom at the end of the hall. This bedroom faces south and receives plenty of sunlight, which is why I lean toward blue in this space. It balances the sunshine. 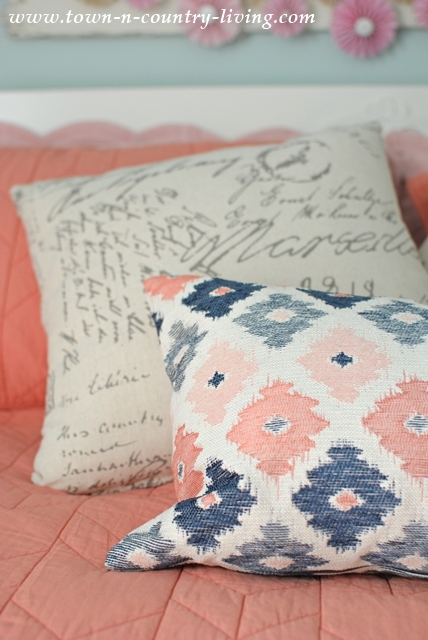 The beautiful coral bedding is from Crane and Canopy and what I love most is that it’s 100% cotton. I’ve always been a huge fan of natural fabrics. My new Chevron quilt and shams are free of toxins and synthetic finishes, which is another plus! The quilt is super light so I’ve layered it over my down-filled quilt for winter. In the summer I can remove some of the layers, or even roll up the quilt and lay it across the foot of the bed to keep the color. I love the Coral Flowers pillow in front that I found at Crane and Canopy, and I thought it paired perfectly with my script pillows. You can find more luxury bedding at affordable prices at Crane and Canopy’s website … up to 70% off prices you’ll find in the department stores. I was also happy to find that a portion of all proceeds go to “A Safe Night’s Sleep,” which benefits women and children affected by domestic violence. I love the color blue with this shade of coral. 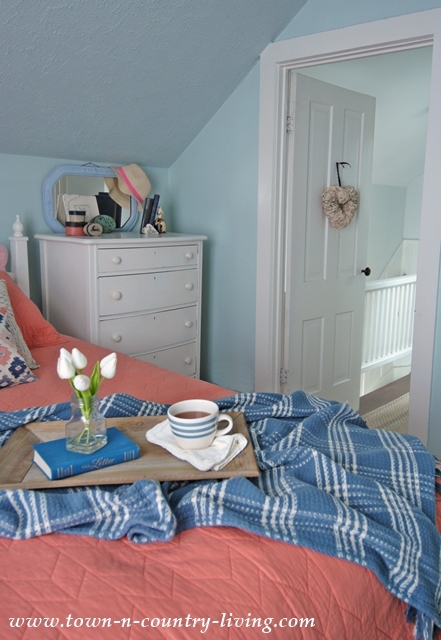 My farmhouse bedroom walls are a pale blue and my blue throw keeps the blue and coral theme going. I feel like the blue keeps the room from looking too summery in the middle of winter. 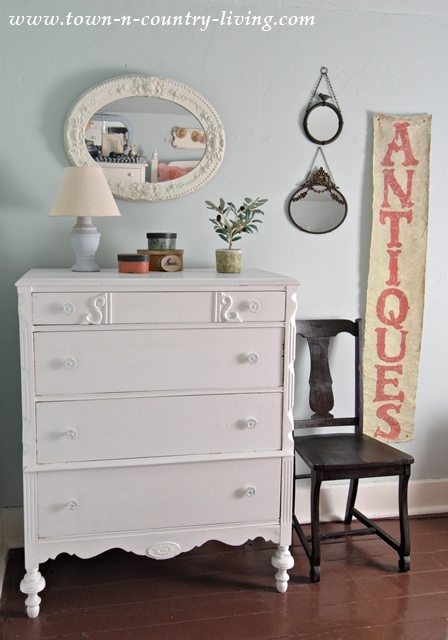 In the other corner of the bedroom I simplified the vignette on the painted dresser. 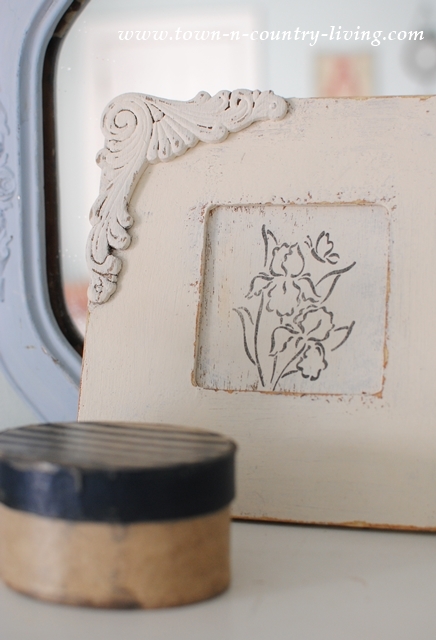 A new shabby chic piece of art leans up against my vintage blue mirror. 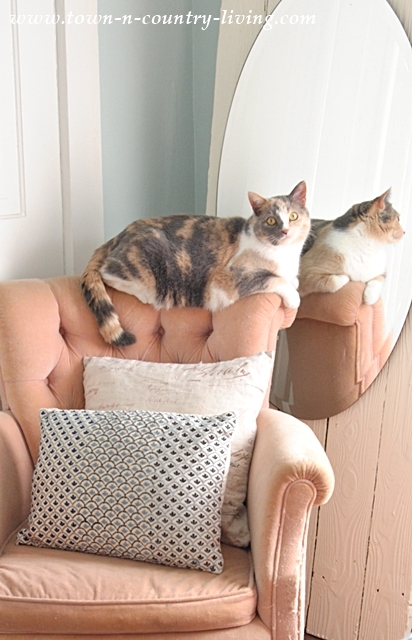 Stella took her perch on the velveteen chair that’s a lighter shade of my new coral bedding. She kept looking at herself in the mirror while I was taking photos. She’s so vain! Either that or she thought another cat was in the room. Well, there was another cat in the room. Our newest member of the family … Sadie, our rescue kitty. Do you see her at the bottom of the door way? Both of them love curling up on my new quilt from Crane and Canopy. I love the new color and it’s so incredibly soft. The next step for my farmhouse bedroom is a new chandelier! When you cabin fever kick in, do you think about updating your rooms, too? Crane and Canopy sent me product for this post, but all opinions are my own. Looks beautiful, such a pretty combination! 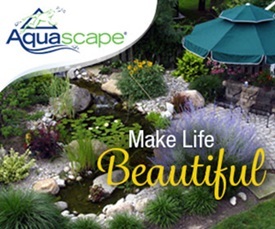 I agree with Bridget–love the combination of colors. Your room looks very inviting, Jennifer. 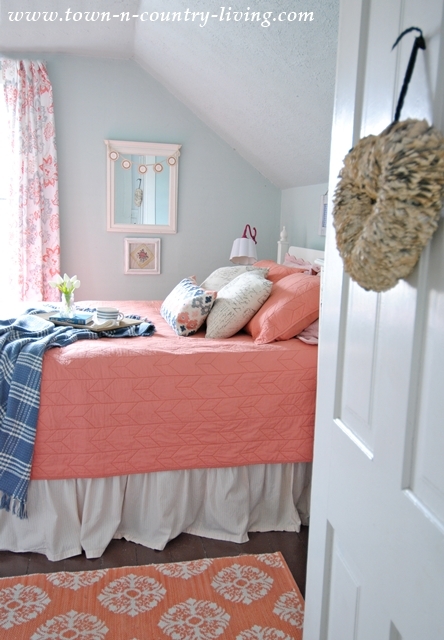 Beautiful room, Jennifer, and it looks so very cozy! I’m particularly impressed that your kitty, Stella, is color coordinated with the room. ???? Your cat matches the chair! 🙂 Beautiful room. The color is a perfect shade of coral. Jennifer, it’s very pretty. I love the coral color. We are remodeling our bathroom/laundry room due to cabin fever. Ha! Your bedroom is so bright and happy. I think coral is the color of the season. Love it….I have a sofa in my bedroom in which the color is similar to your velveteen chair….Love the coral in your bedroom! Goodness, Jennifer! Your bedroom is so lovely. The blue and coral are wonderful together. For some reason, I have not been getting your posts. I thought I was already following you on Bloglovin, but maybe I wasn’t. Google has changed so many things, it seems, on their Blogger format. 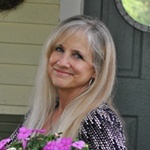 Jennifer, love the coral – makes me think that spring is not too far away. 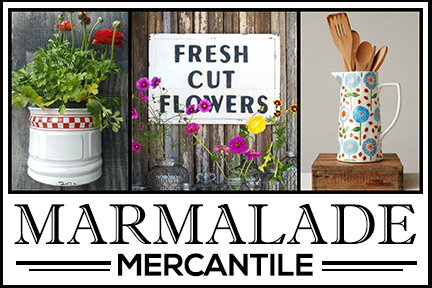 QUESTION: Awhile back you mentioned a great store in Crystal Lake. I tried to go back through your site to find the name of it but had no luck. Can you tell me the name? I live in Elk Grove Village and would love to take a ride there to check it out. 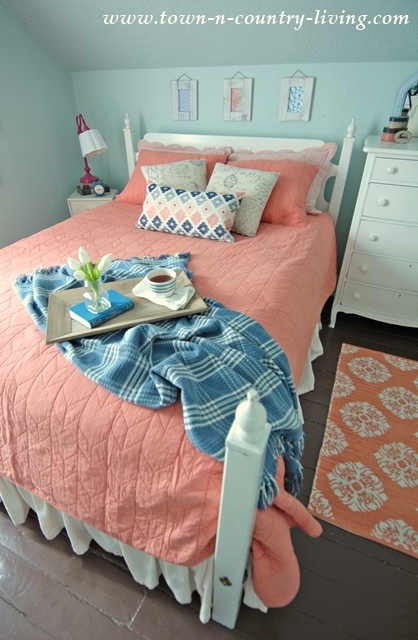 Beautiful room, and I love coral and light blue together! What color paint do you have on your bedroom walls? 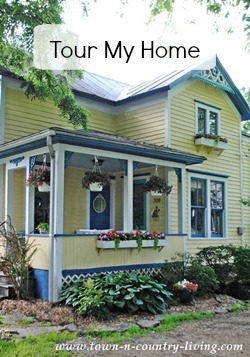 I’m searching for the perfect paint color for my guest room!